[tweetmeme] Arnica is probably the best known remedy in Homeopathy. It is often the first remedy we think of when there is injury or trauma, especially when there is bruising involved. Below are some of the indications as to when Arnica can be useful. Bruising – This remedy is helpful for just about any bruise. It is also useful when a muscle simply “feels” bruised but there is no discoloration. Everything feels too hard – It is a useful remedy after an injury or trauma when everything feels too hard, even the bed or pillow. General aggravation from exertion – If your body is sore after anything from running a marathon to gardening this remedy may help. Sprains – This is generally one of the first remedies to consider for a sprained ankle, wrist or knee. Restless in bed – It is an excellent remedy after an injury when you cannot find a comfortable position in bed. 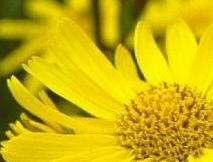 “I’m fine” – Arnica is also a wonderful remedy for someone who has been injured but continually insists they are fine and do not want to seek medical attention. Dental extractions – This is a wonderful remedy to use following a dental procedure, either for pain or bleeding. Concussion – Arnica is one of the main remedies for a concussion. If a concussion occurs seek emergency medical attention, however Arnica is safe and effective to use while waiting for medical help. There will be marked dizziness and pain. The injured person may continually say there is nothing wrong with him/her. Back strain – This remedy can be used for sprains and strains of the back when there is marked soreness. Arnica can be found in oral-pellet form and as a cream. For bruising and things of that nature both can be used. When choosing Arnica in pellet form follow the directions on the bottle. We do not diagnose or treat disease. If you require a diagnosis contact a licensed medical physician. This is for educational purposes only. If your injury is life-threatening seek emergency medical care immediately. This entry was posted in Remedies and tagged back strain, bruising, homeopathic remedy, homeopathy, injury, sprains, trauma. Bookmark the permalink.